Cyclone Phailin Hits India With 120 MPH Winds; Thousands Flee : The Two-Way Cyclone Phailin has struck India's coast in the Bay of Bengal, where more than 500,000 people have fled vulnerable areas along the coast. 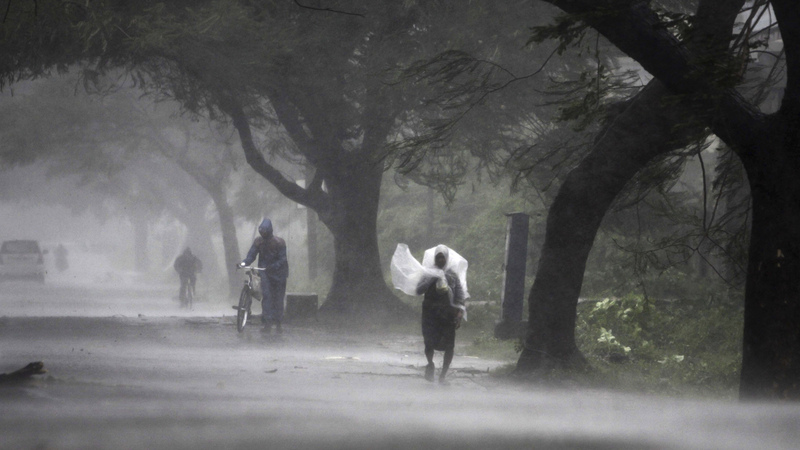 Phailin could pack hurricane-force winds for hours to come. A man covers himself with a plastic sheet as a shield as he walks to a safer place near Gopalpur in eastern India Saturday. 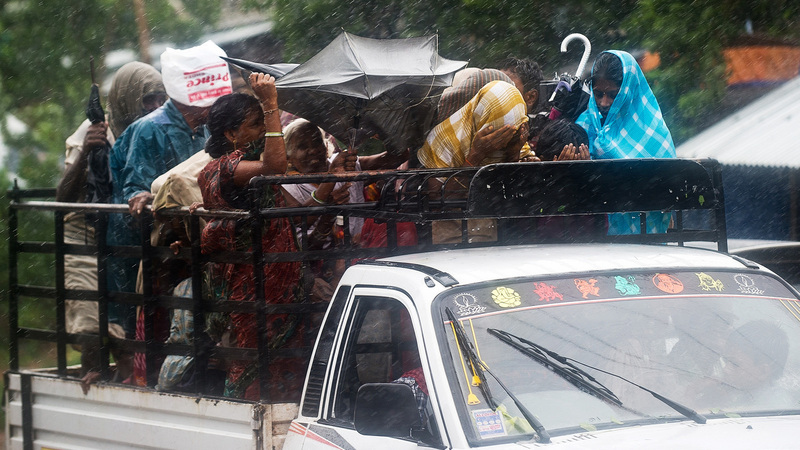 Hundreds of thousands of people living along India's eastern coastline took shelter from the massive powerful cyclone Phailin. It is past midnight in India now, and the cyclone's winds aren't expected to dwindle for hours to come. Due to its massive size and creeping speed, the process of making landfall took a long time — and that also means the storm is soaking the areas it passes over, according to India's Meteorological Department. Saying that some areas should expect rainfall totaling 9 inches or greater, the weather agency predicts "Gale wind speed reaching 100-120 kmph (62-75 mph) would also prevail for 6 hours and 60-70 [kmph] for subsequent 6 hours" in the hardest-hit areas. "The town was in total darkness, the headlights of our vehicle illuminating felled trees and power lines blocking roads. Store signs and other debris were being pitched high in the air by powerful storm gusts. Elaborate decorations for a major Hindu festival that people were due to celebrate this weekend were strewn across the main road."